To show how traditional Georgian bread is made we spent a morning with our local baker, Zaur Skhirtladze, who works at the bakery, Trepezi in our neighborhood in Tbilisi. 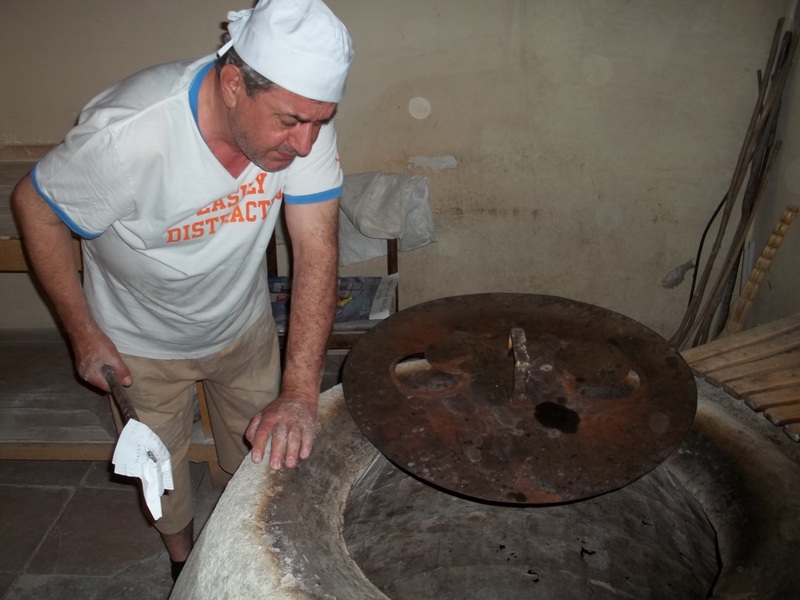 A typical day at our Georgian bakery begins at 7.30 a.m. when Zaur lights the deep circular oven called a tone. The tone will take around one and a half hours to reach the required temperature for baking bread. 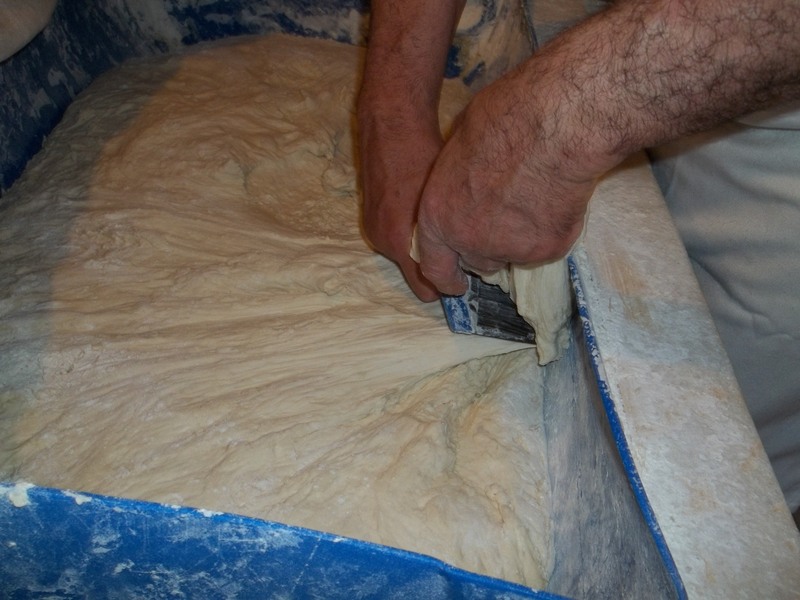 The baker begins by putting 25 kilograms of flour, 700 grams of salt and 250 grams of yeast and 200 grams of sugar into a mixing basin. Not all bakers use sugar but our baker believes it gives a better color to the bread and helps to prevent it becoming dry and hard. The ingredients are enough to make around 70 breads. 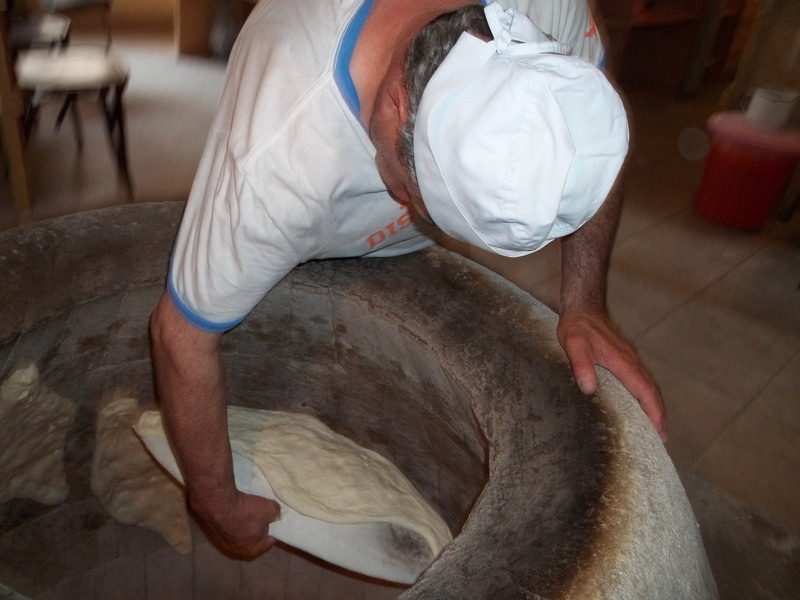 The baker makes a depression in the flour and then adds 16 litres of tepid water and begins mixing by hand. The mixing process takes about 5 minutes. 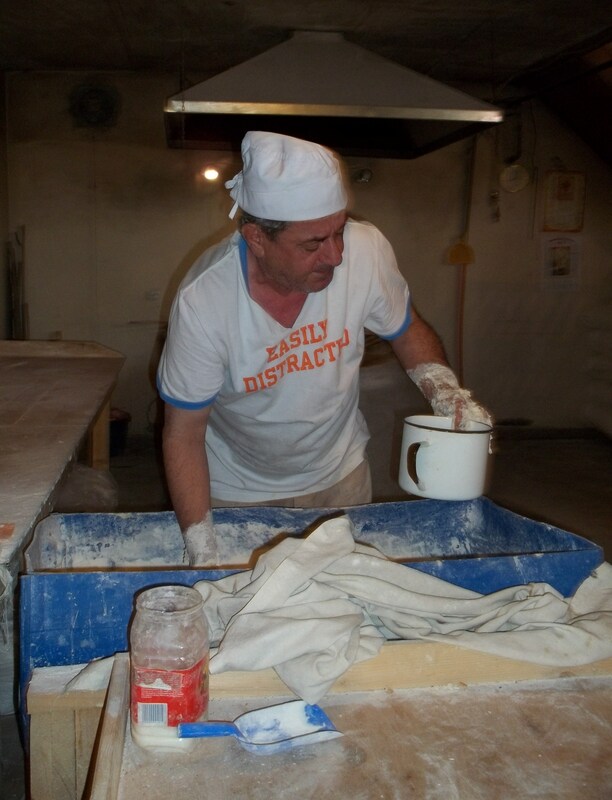 When the mixing is complete the baker covers the dough with a linen cloth and plastic cover. 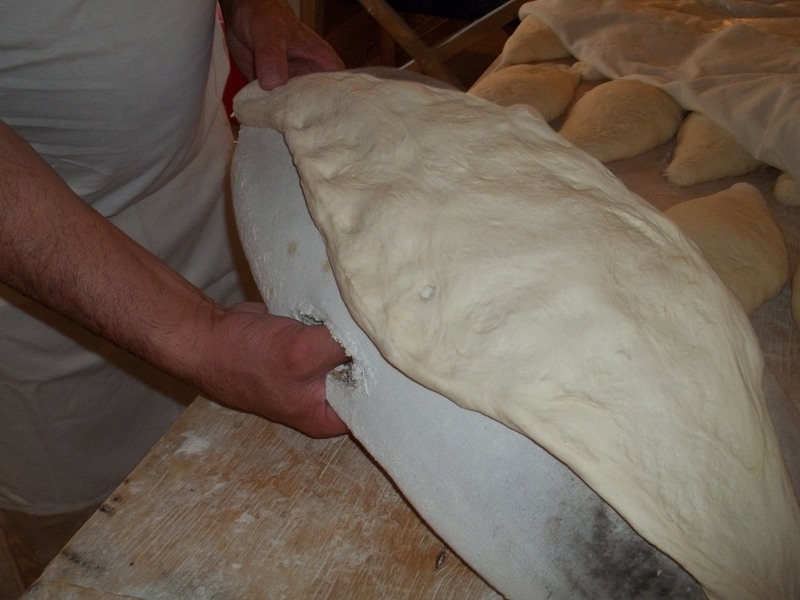 The dough is left for one and a half hours to rise and become two and a half times bigger. 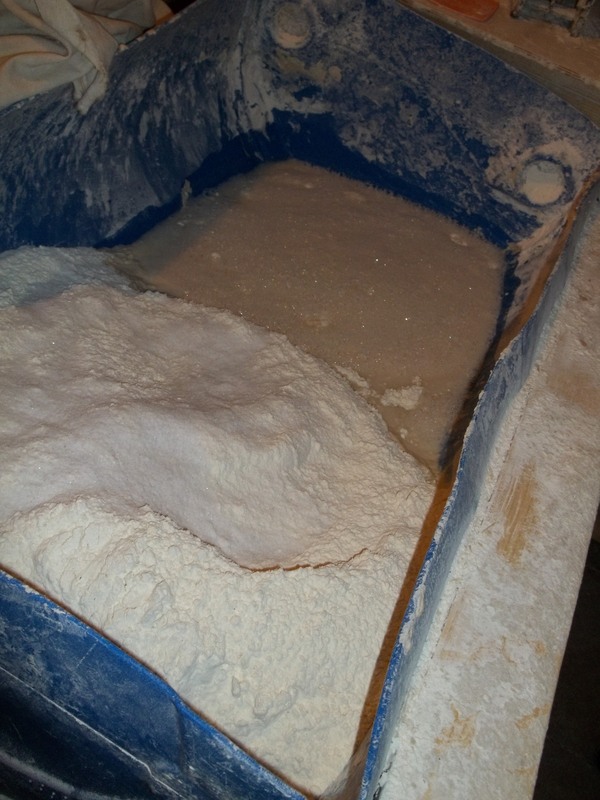 When the dough is ready the baker cuts off pieces, weighs them (they must each weigh 600 grams) and places them on a work surface that has been dusted with flour. 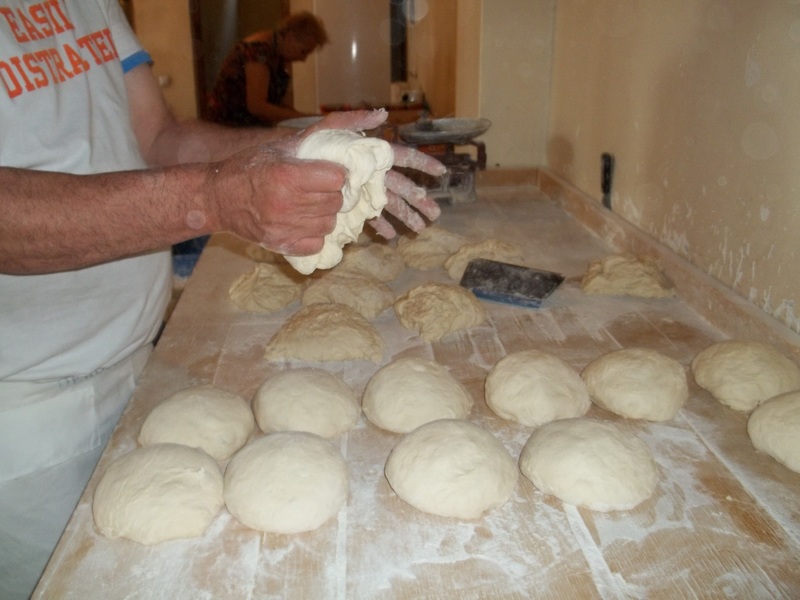 Each piece of dough is then shaped by hand into a mound shape. These mounds are then rolled out to create a sausage shape, tapered at the ends. 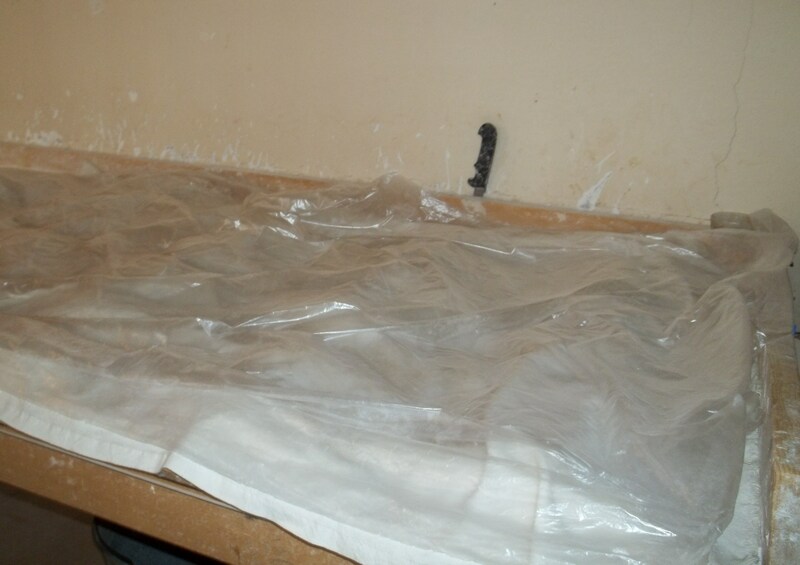 The dough is then covered with linen cloth and a plastic sheet and left for 10 minutes. Covering the dough again helps it rise slightly. 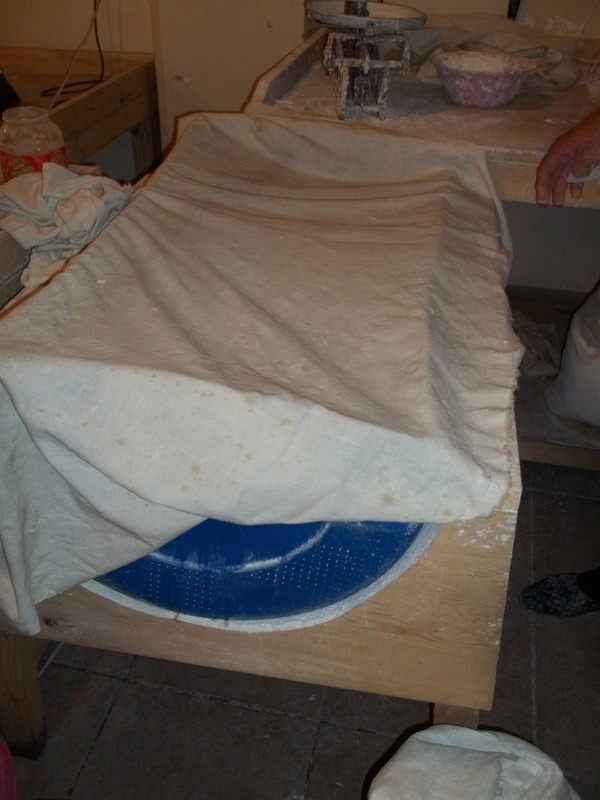 After 10 minutes the dough is uncovered and each piece is stretched onto a special linen covered pad that has a wooden base. The pad is called Lapati in Georgian. 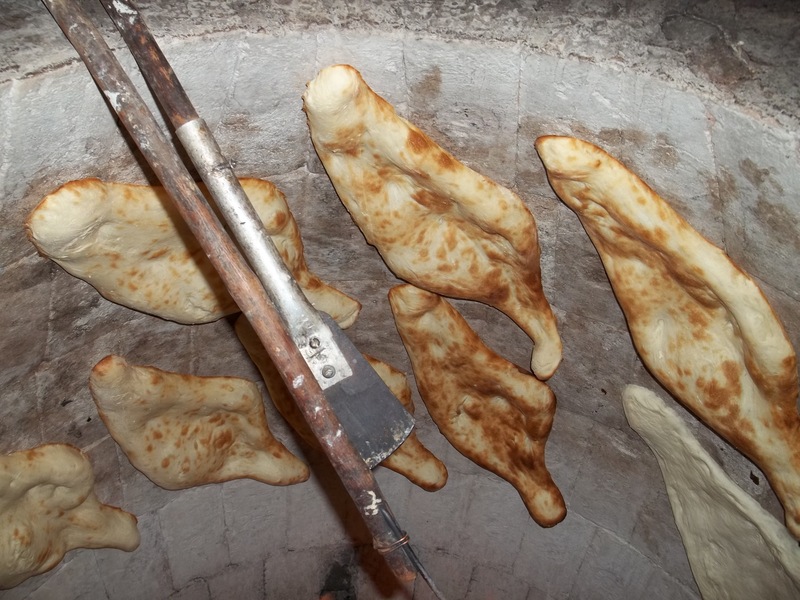 The dough is stretched in the middle and at each end to form the traditional shotis puri (შოთის პური in Georgian) shape. The Lapati has a thumb hole that is used by the baker when he places the dough in the tone. 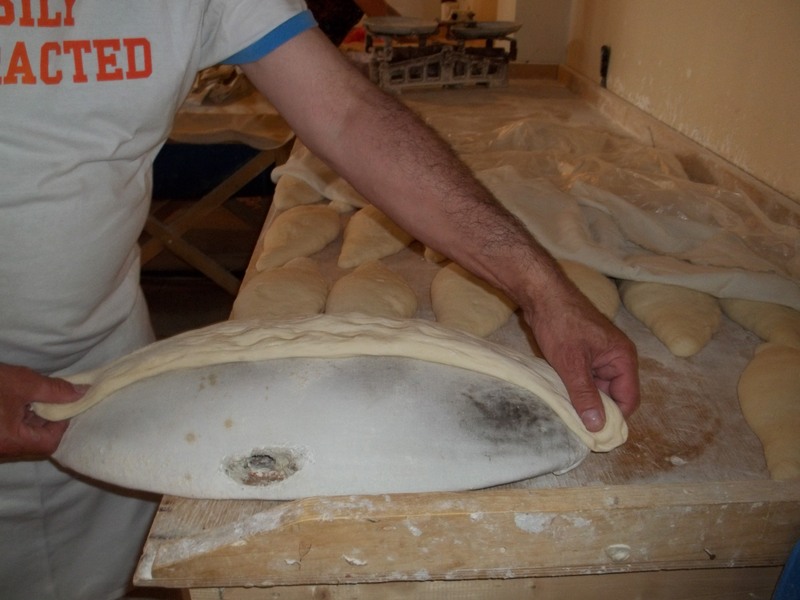 Using the pad, the baker leans into the very hot tone and presses the dough firmly against the tone wall. If it is not pressed firmly it will fall off. The baker will repeat this until the tone is full. 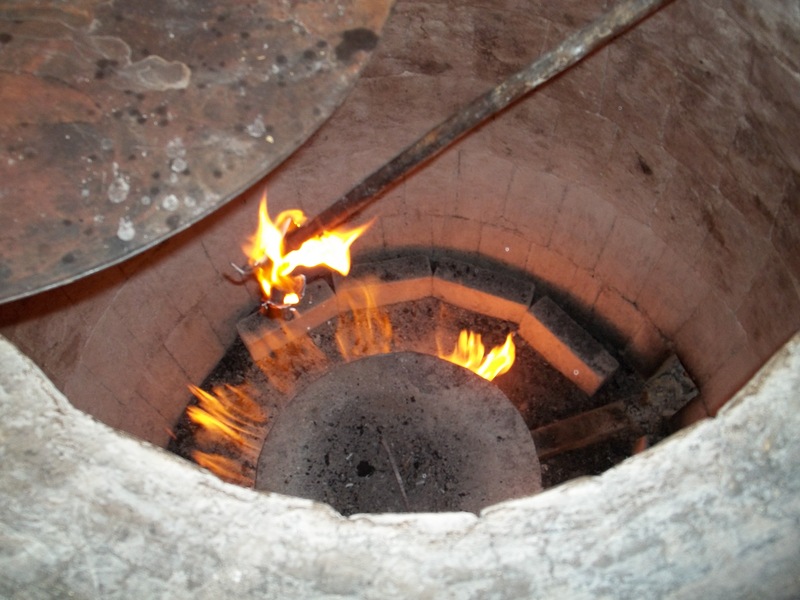 The bottom 50cm of the tone is not used because it is too hot and the bread will burn. As the bread bakes it turns a golden brown and is ready to be removed in 7-8 minutes. Removing the bread requires considerable skill. The baker uses two specialized tools. 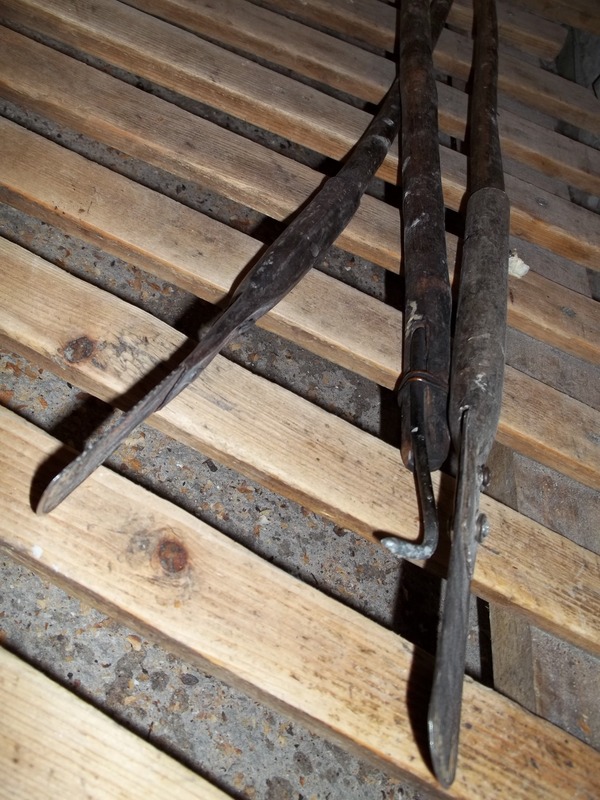 One is called Kavi and is used to stab the bread and the other is called Safkheki and is used to dislodge the bread from the wall of the tone. 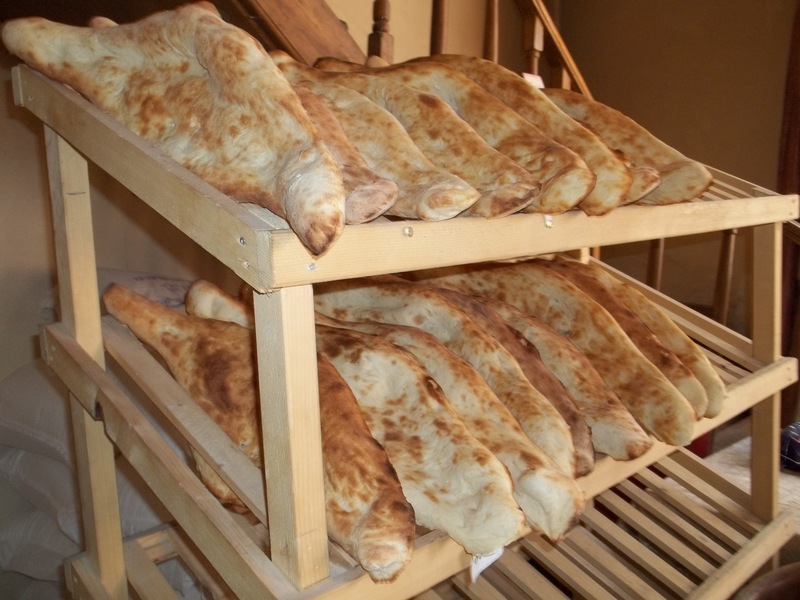 The freshly baked bread is placed on wooden racks to cool. The smell of the freshly baked bread is absolutely amazing! When the bread is sold it is usually part wrapped in a sheet of paper. It is usual to see people walking down the street holding breads wrapped in this way. Zaur gave us a loaf of bread that we had watched being made. Fantastic! 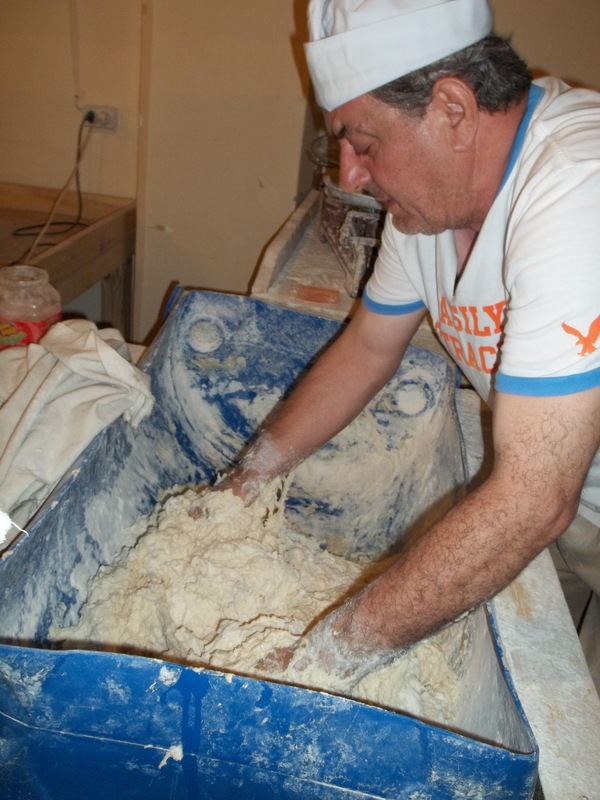 We would like to thank Zaur Skhirtladze and the Trepezi bakery for showing us how real Georgian bread is made. Thank you so much for the wonderful award! I am very pleased that you like the site. Thank you! It was very interesting to spend the morning with the baker. He is such a nice guy. Very interesting! I was wondering about how the bread seemed to defy gravity in the tone — what a hot job leaning over the oven trying to get the bread to stick to the wall. It is amazing how it sticks to the tone. 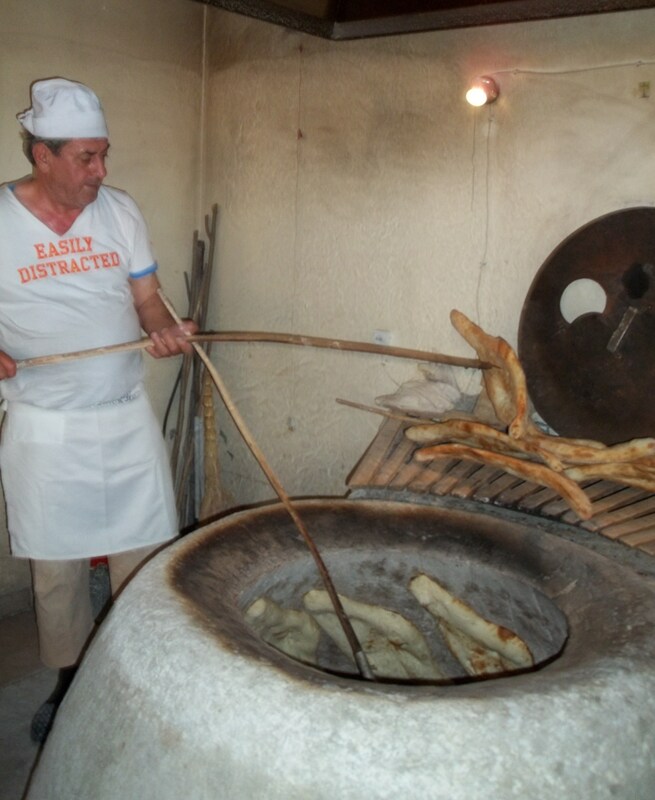 The heat is incredible -the baker has to lean over the fiery heat and place his hand and arm inside. That is a very interesting process. I particularly like the t-shirt he was wearing! Wow! very interesting…love the guys t shirt too! This bakery is amazing!!! My mom loves bread very much and wherever she travels she tries to find delicious bakery in her visiting place! and Zaur is great! 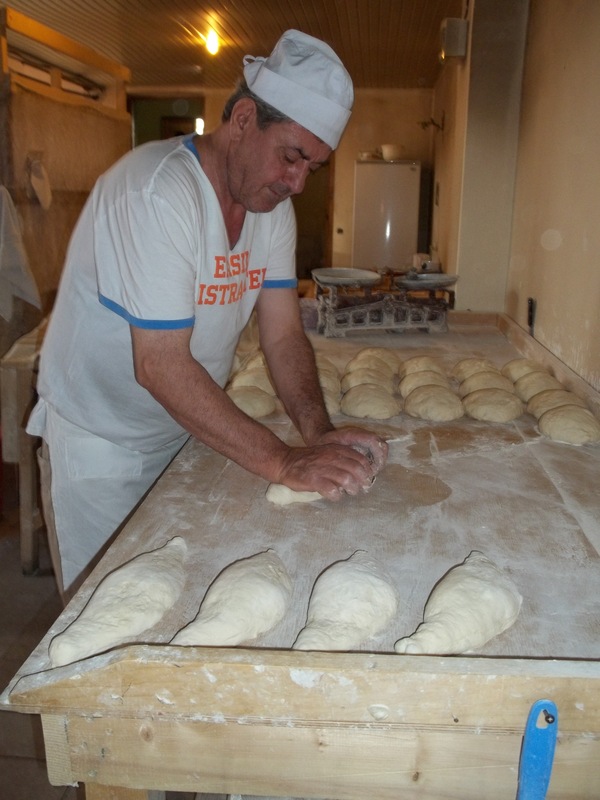 He takes quite lots of time to make his bread by hands that make those breads more delicious!!! mmmm…. *drools* I wish I could taste it…. Zaur is great Kevin. He has a wonderful sense of humor and he is very proud of his work. There’s nothing like fresh, home-baked bread! This method of baking is so interesting, too — thanks for sharing this story. It’s a pleasure Lisa. I’m pleased that you enjoyed it. I hope you do visit one day Diane. I know you would love this beautiful country. Thank you for showing this. I love to make bread and can’t wait to try and make a smaller quantity of this bread at home. I didn’t know anything about Georgian food before, but now I have taken an interest. Thank you for the photos! Thank you so much for posting this. I lived in Georgia for a year in 2012. 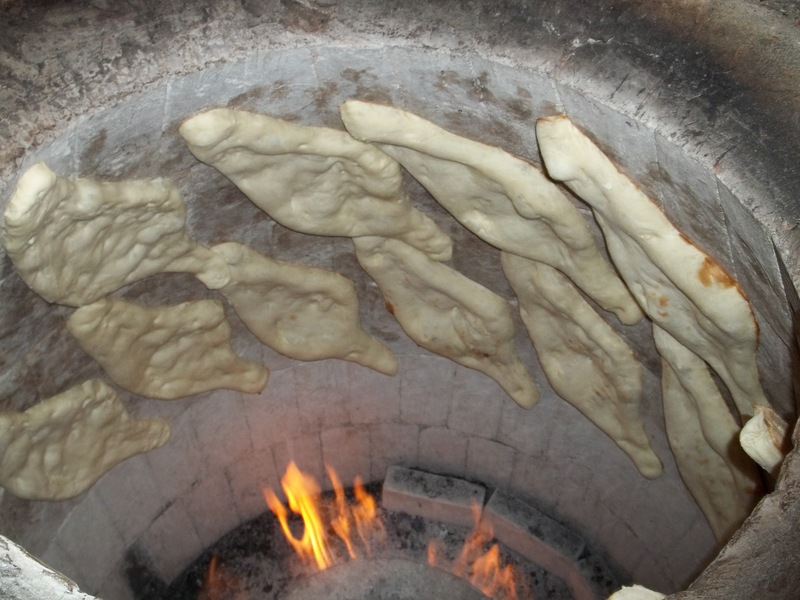 I miss it so much, and this brought back many delicious memories eating of warm ტონის პური in the morning before work. As it happens, I am trying to build my own tone so that I can make this bread! I’m having a hard time finding the correct dimensions for the oven, as well as other details. Is there any way that you could help me get this information? Are you still in contact with Zaur, or could I get in contact with him? This has been a dream of mine ever since I stepped foot back in the U.S. I look forward to hearing back from you! Hi Hana, I am so pleased to hear that you enjoyed your time in Georgia and thrilled that you want to make a tone. Unfortunately, Zaur moved to Armenia and I do not have contact details for him. I bought a tone here in Georgia but I don’t know if they are exported. Mine is a smaller version of the ones used in bakeries and less robust. I will try to find out how they are constructed and will get back to you if I find anything. Best wishes, Georgia About.